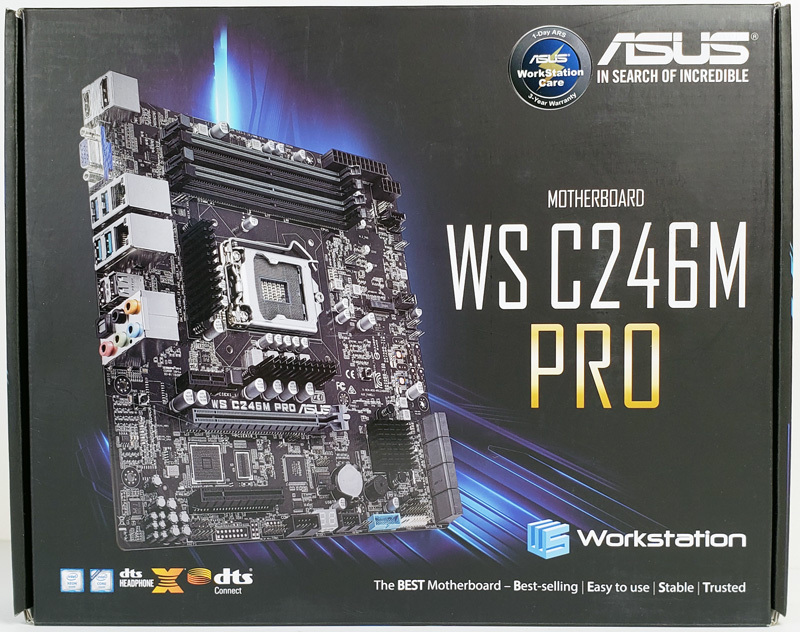 The ASUS WS C246M Pro Motherboard weighs in as a Micro-ATX board supporting Intel 8th generation Core and Xeon E-Series processors, with additional support for Optane Memory compatibility. 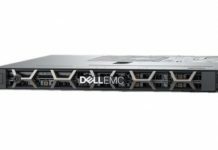 Cliff Robinson also wrote about the WS C246M Pro and ASUS’s new Intel Xeon E-2100 Workstation line back July of last year during the initial Intel Xeon E-2100 Launch. ASUS also notes its rack-optimized design for better cooling hinting at a server version. 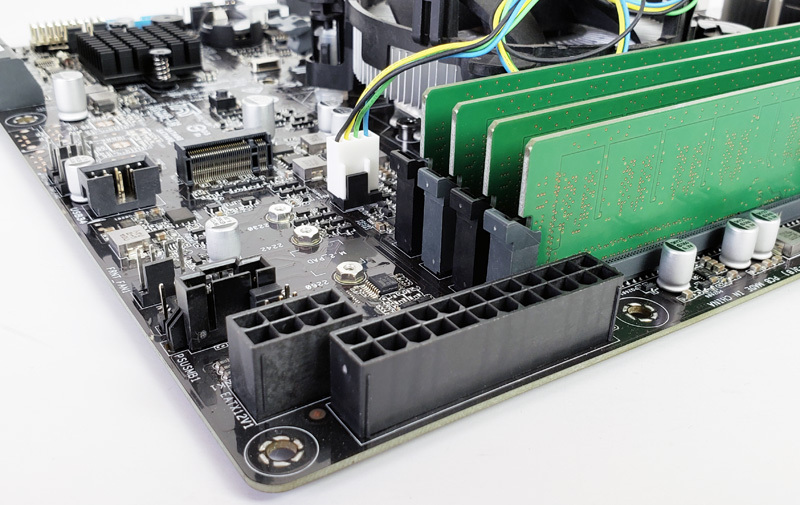 Although most will find there way into small form factor workstations, there are pads on the motherboard for a BMC on alternate versions. 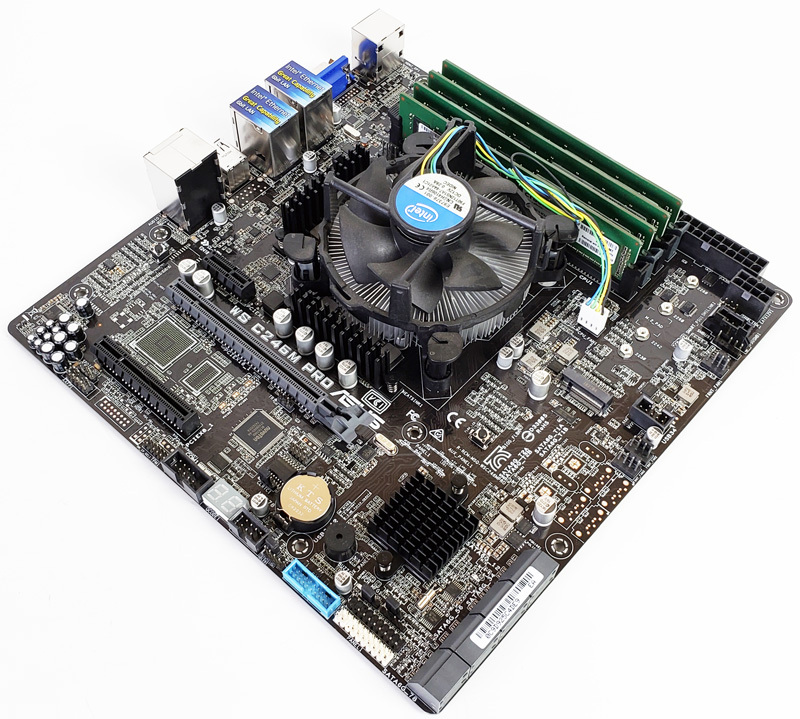 For this review, we are focused on the workstation product, the ASUS WS C246M Pro motherboard. The retail box for the motherboard is large to fit a motherboard of this size. 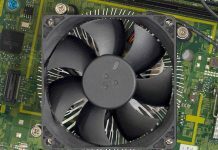 Graphics that describe features adorn the retail box which describes motherboard features. A full detailed list of specifications found on the back of the box, with a note that this motherboard supports ECC memory and Intel Xeon E processors. After opening the box and removing the motherboard, we find the accessory box inside the right side of the retail box. 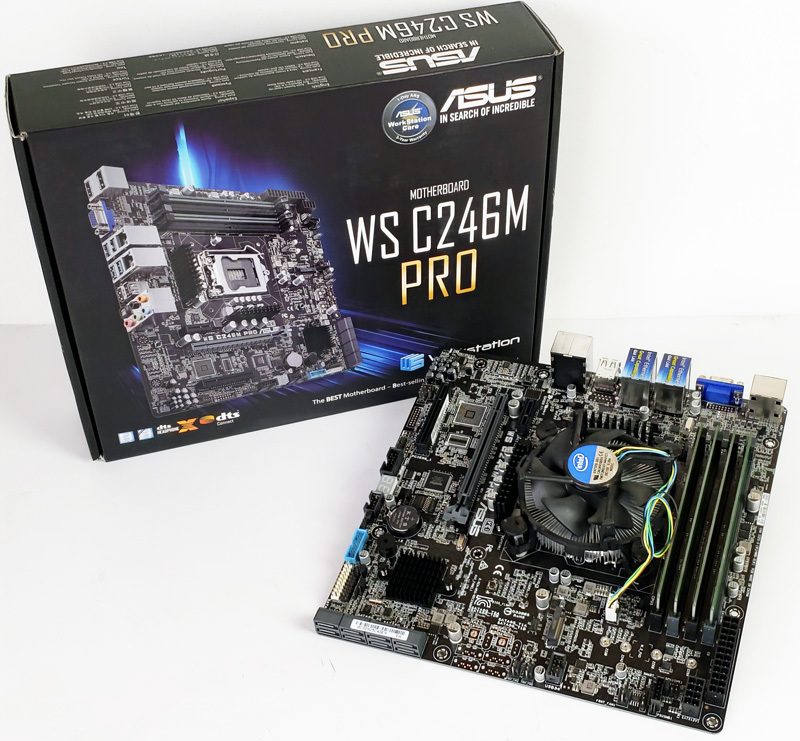 After removing the motherboard from the retail box, we get our first look at the ASUS WS C246M Pro Motherboard. Here we see the ASUS WS C246M Pro Motherboard setup for our testing; overall the board layout is clean with options in positions we are familiar with, with one exception. A M.2 slot is in a different location than we usually see, just below the memory slot area. The M.2 slot is in a good position for NVMe drives which would be close to case fans instead of under PCIe graphics cards for front to rear airflow chassis. We have space for a dual-slot GPU at slot 2, and a 10G network card using slot 3. 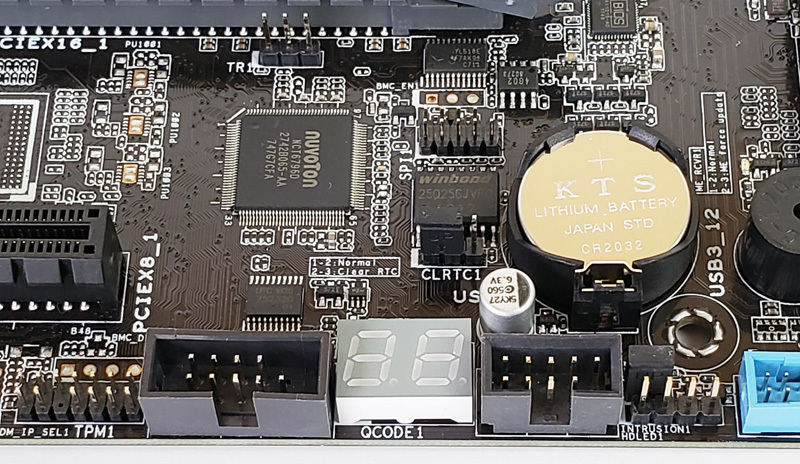 At the lower corner, we find 8x SATA ports, eight of these ports connect through the Intel C246 chipset. Power connectors located at the corner of the motherboard show an excellent location to keep power cables centralized to one area. 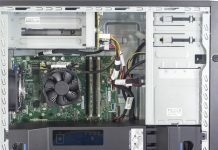 Just to the right of PCIe slot 2, we spot a power button; this location is not blocked by a graphics card. We would like to see a reset button here as well; one is not available on the motherboard. In a server, this would be less necessary, but in a workstation it is a useful feature. We do like the fact a QCODE LED squeezed in between USB headers. 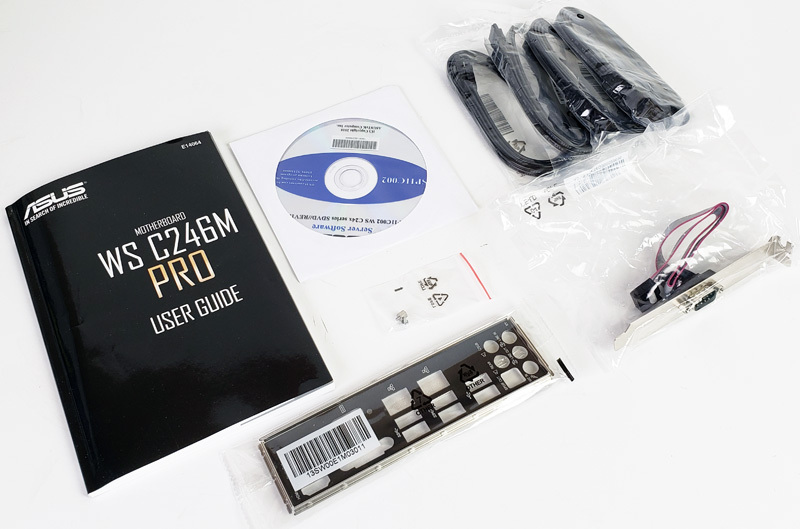 Many video output options are available on the WS C246M Pro Motherboard giving it flexibility for different setups. Onboard 1GbE NICs include Intel i219-LM (PCH) and Intel i210 models which are premium options over Realtek NICs. The Intel i210 NICs have become the standard server NIC of this generation and thus they are very well supported. For example, one can run VMware ESXi on this board and it will recognize the Intel i210 NIC out of the box. The addition of additional USB 3.0 and onboard audio set this apart from a typical server platform. 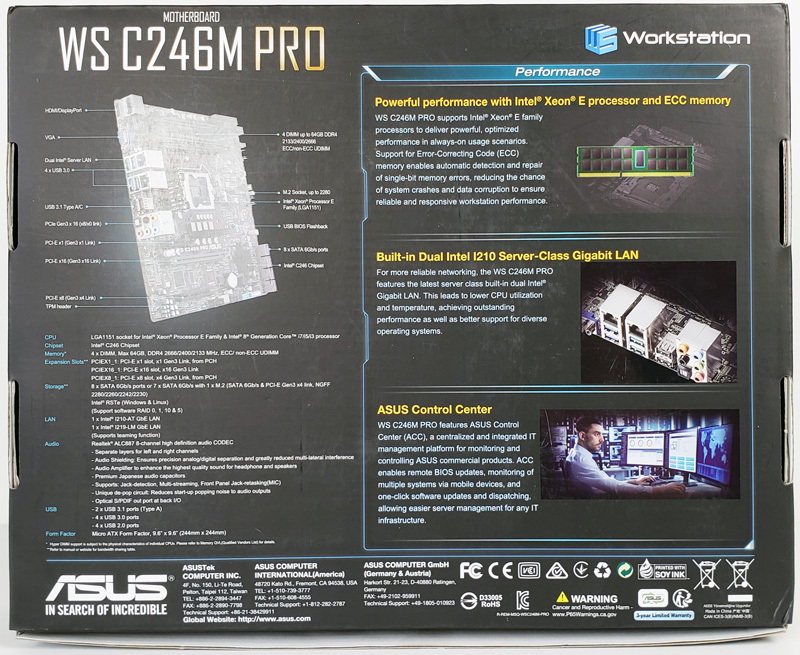 Next, we are going to look at the software and BIOS for the ASUS WS C246M Pro Motherboard. Then it will be followed by our performance testing. but udimm ECC won’t work with your i3 or any i5, i7 consumer model, right ? GourouLubrik – Intel has supported ECC UDIMM on Core i3 for several generations. Intel supports the Core i3 to segment its product lineup and offer lower-cost entry server configurations.